I want to know a lot about my cholesterol. So, you think you're getting pretty smart. You know that there are a couple of very important fats in the body, triglycerides and cholesterol. And you know that the cholesterol is made up of "good" (high density lipoprotein, or HDL) cholesterol and "bad" (low density lipoprotein, or LDL) cholesterol. You want more of the former and less of the latter. You know that these good and bad species of cholesterol are carried around the body along with particular types of proteins in particles known as "lipoproteins". You know that statin drugs can dramatically lower your LDL and lower your risk of coronary artery disease. Well, as that famous TV chef says, "let's kick it up a notch". Really, that's just the beginning. It turns out that not only is the amount of LDL important, but so is its size. Remember, LDL is the cholesterol that floats around in the blood and can get into the arteries. The barrier to this is in large part the "endothelium", the cells that line the arteries. The endothelial cells are very close together and form a carpet. This carpet is made up of individual cells, and there are small areas in between them that allow small particles to pass back and forth through the artery wall. The artery needs to have access to the oxygen and other nutrients in the blood, so these small "holes" make sense. By small, we mean really small . . . around 260 millionths of an inch! (A millionth of an inch is called an "Angstrom"). It makes some sense that the smaller the LDL, the more likely it is to be able to cross the wall. It turns out that most of our LDL is right around that 260 Angstrom size. How much difference does a few millionths of an inch make? A 5% smaller diameter LDL particle leads to a 50% increase in the rate of uptake by the arterial wall! LDL particles less than 258 Angstroms can get through the holes between cells quite easily and are therefore can be quite "atherogenic" (that is, cause blockages in the arteries). Those larger than 263 Angstroms are much less likely to cause blocked arteries. Now, we all have LDL particles that range from 200-300 Angstroms. It is the "peak" LDL size that has much to do with determining our atherosclerotic risk. If we have predominantly large LDL, we're called "Pattern A", if we have lots of the nasty small LDL we're called "Pattern B". Those with LDL between 258 and 263 are intermediate, or "Pattern I". Likewise, the "best of the best" is the part of the HDL known as HDL2b. This particle appears to have the most influence on reverse cholesterol transport, or taking cholesterol out of the tissues and back to the liver where it will not do harm. Those with HDL2b's that make up less than 20% are at higher risk, those that have greater than 28% have an optimal pattern. You might wonder why HDL is both "small" and "good". It is so small it can get through the small holes in the endothelium to pick up the bad cholesterol and bring it back to the liver. Furthermore, it is structured such that the cholesterol it contains is not easily oxidized, and non-oxidized cholesterol is less toxic. An illustration from the Berkeley Heart Labs showing these particles is shown below. 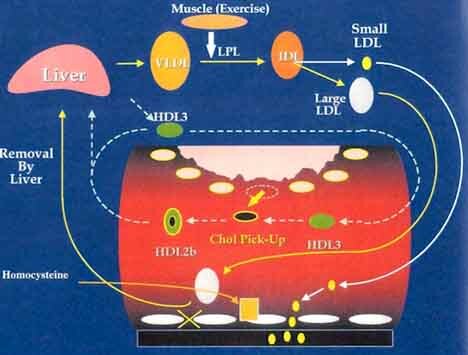 The items of current interest are the LDL subparticles, and the small HDL sub-particles. This is an example an LDL gel electrophoresis. The particles are measured. The peak size of the particles is 261.5 Angstroms. This is an "Intermediate" pattern, or Pattern I. So what difference does all of this make? It's only important if you can do something about it . . . and you can. What's really important about this is the fact that not all lipid disorders are helped optimally with the same agents. It seems that everyone with any disorder of cholesterol is on one of the "statin" drugs these days. Although statin drugs do lower LDL, they lower all of the different sized LDL particles at the same time. They do little compared with other agents to raise the good HDL cholesterol. There are a large number of people who may respond best to niacin or fibric acid medications rather than the currently more popular statins. Combinations of these agents may be best for many. - They respond better to diet therapy. - They respond best to the less expensive niacin and fibric acid medications. - When treated successfully, they tend to improve better than Pattern A patients. 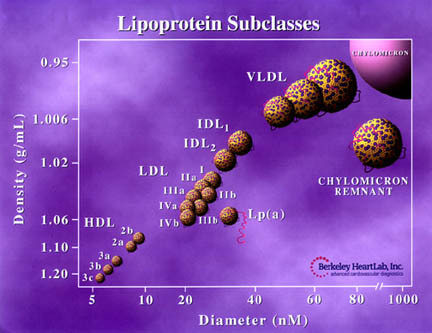 Sophisticated studies of lipoprotein particle size can also help make the decision whether medications are necessary at all in borderline cases. Finally, these studies may help pinpoint abnormalities you may have inherited from your parents or grandparents, abnormalities that don't show up with "regular" cholesterol tests. Studies using highly sophisticated studies such as "Gradient Gel Electrophoresis" can characterize the size of LDL and HDL. These studies are available from the Berkeley HeartLab (www.berkeleyheartlab.com), which makes an active effort to recruit physicians to use their services. Okay . . . keep going ! Tell me about Lp(a). There are also other important factors involving lipoproteins. One lipoprotein that may be important in certain people with heart disease is called Lp(a), also known as "lipoprotein little a". This is a fairly large molecule, but it tends to be easily oxidized (remember that oxidized cholesterol is much more toxic). Furthermore, there is a protein "tail" which can stimulate blood clotting. This lipid-containing molecule is not really very much affected by the types of food that we eat, but appears to be closely related to the genes we inherit from our parents. When it is tested for and found to be elevated, it is not generally affected by treatment with the statin or fibrate drugs. Niacin however can lower the levels by around 35-50%. Vitamin E and other anti-oxidants are generally recommended to try to combat the tendency of Lp(a) to be oxidized. Lowering the LDL to less than 80-100 is also felt to be beneficial in minimizing the toxicity of Lp(a). Lp(a) is generally not tested for by most physicians at the time of this writing (1999).